We were pleasantly surprised to find that South Africa has not been inundated with the American fast food chains. Yes, if you are in dire need of some American-based grease and in a large town then you will most likely be able to find a McDonald’s or a Kentucky Fried Chicken. However, the two local hamburger chains, Wimpy and Steers, seem to far outnumber all other chains. Since we definitely love a good hamburger, we could not pass up the opportunity to conduct our own independent taste test to see how each chain’s burgers would stack up. We noticed our first Wimpy’s in the Johannesburg airport. I found it to be an odd name for a burger joint. However, Kevin found humor and irony in the name. He had to explain to me that “Wimpy” was the name of the pudgy, weak counterpart to Popeye. Instead of eating spinach like Popeye, Wimpy consumed hamburgers. So, the name is actually quite clever. I opted for the cheeseburger and fries combination, although the menu extends beyond burgers. Wimpy’s has table service, so we ordered with our server and it did not take long for our meals to arrive. If I had not been starving, my first bite could have very well been my last. The burgers reminded me of flat, tasteless frozen patties and the toppings did not add to the overall feeling of freshness. Even the fries did nothing to compensate for the lackluster cheeseburger. The food definitely fell short of my expectations and we both agreed that our first visit would be our last. A name like Steers immediately conjures up visions of large beefy cattle. The chain lives up to that name by serving 100% pure beef, flame grilled burgers plus hand-made, seasoned fries. The food far exceeded our expectations for a fast food joint. Was it just a fluke? No! Our opinion was solidified during a second visit of the flame grilled “steer” burger and homemade fries. 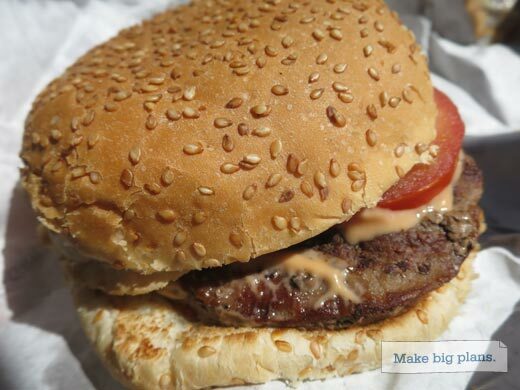 Which Burger Is Better: Wimpy or Steers? Our recommendation would be to steer clear of Wimpy! Go to Steers instead. The flame-grilled burger and seasoned fries get our vote for the best fast food burger and fries in South Africa. The flame-grilled burger at Steers. Their fries are quite tasty as well.